Last night I was in Old Dalby giving a talk and cookery demo to the lovely ladies of their WI about incorporating wild food into the kitchen. Regular readers of this blog and those who follow my Twitter account will know I am a huge fan of raiding the wild larder for my recipes so it was wonderful to see so many people in the village hall who were keen to know more about it. I brought along plenty of things to try and will be popping the recipes up on here over with the tag “Old Dalby WI” if anyone wants to find them all. 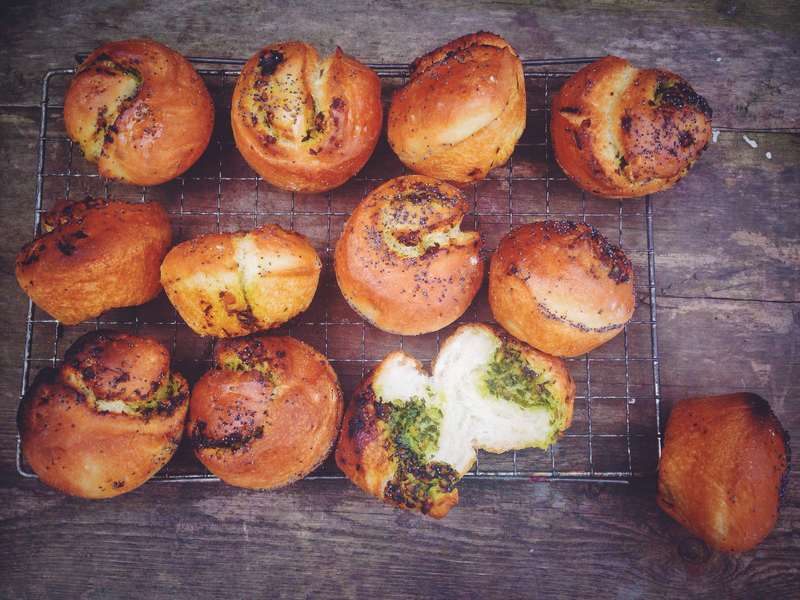 First up are these little wild garlic pesto ciabatta rolls. 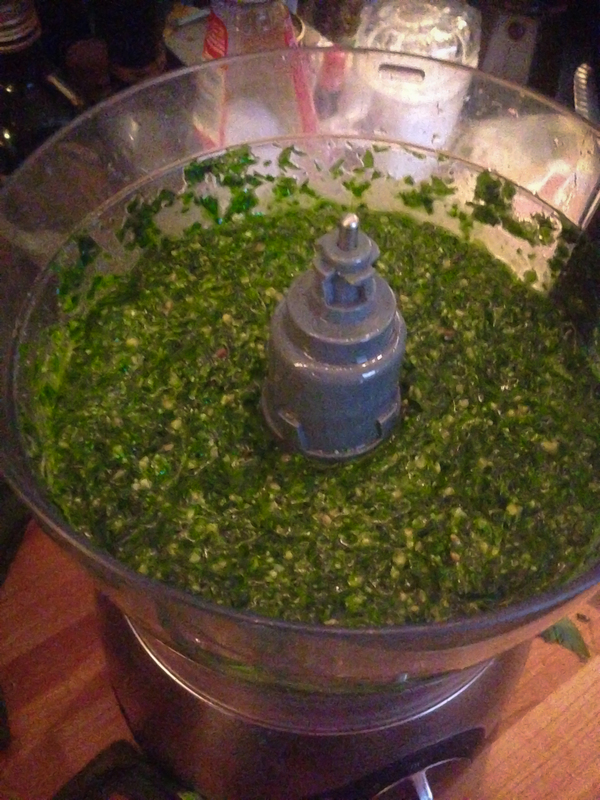 I always make a HUGE batch of wild garlic pesto when the season hits, I put plenty into jars and store in the fridge and the rest I portion off into ziplock bags and freeze flat allowing me to break some off throughout the year and stir into pasta, make more bread, serve with lamb, make hummus, basically I use it in most things! Place the leaves in a food processor and blitz, they will stick to the sides so start to slowly pour in the oil as the blades spin, you can add more leaves as they break down. Keep adding leaves and oil until you get a consistency you are happy with. Add the nuts and cheese and season, blitz some more and add a little more oil to loosen. Decant intio sterilised jars and cover with a layer of oil. 1: Put your flour and salt into a mixer, give it a stir and make a well in the centre. 2: Add the honey to the warm water and stir to dissolve, add the yeast and stir then the oil. Pour into the flour. 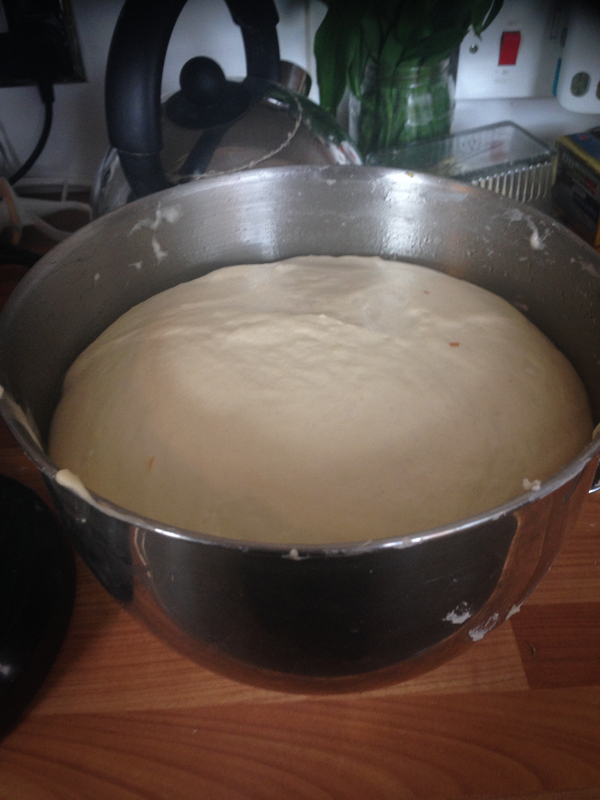 3: Have the bread hook attached to your mixer, start the machine on slow speed then increase to medium high, mix for a good 10-15 minutes or until the dough has formed a soft, smooth ball (my mixer is a bit rubbish so it took a while but just keep an eye on it). 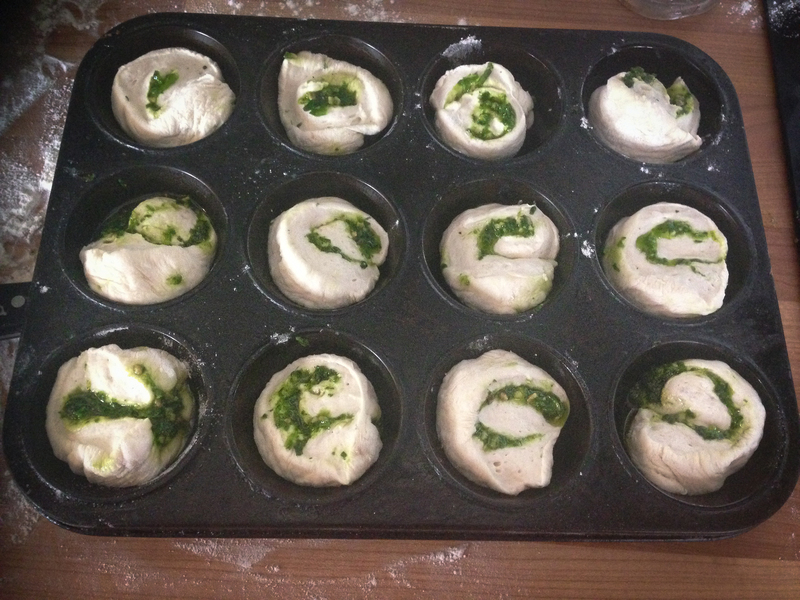 4: Put the dough in an oiled bowl (the mixer bowl is fine) and cover, allow to rise until doubled in size. 4: Tip the dough onto a floured surface and divide into two more manageable halves. 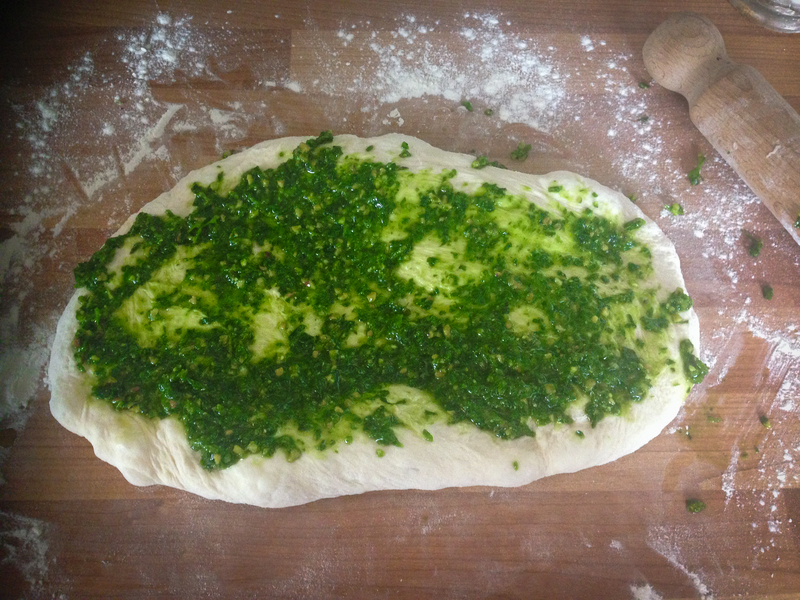 5: Roll and stretch the dough into as close to a rectangle as possible then cover with a layer of pesto. 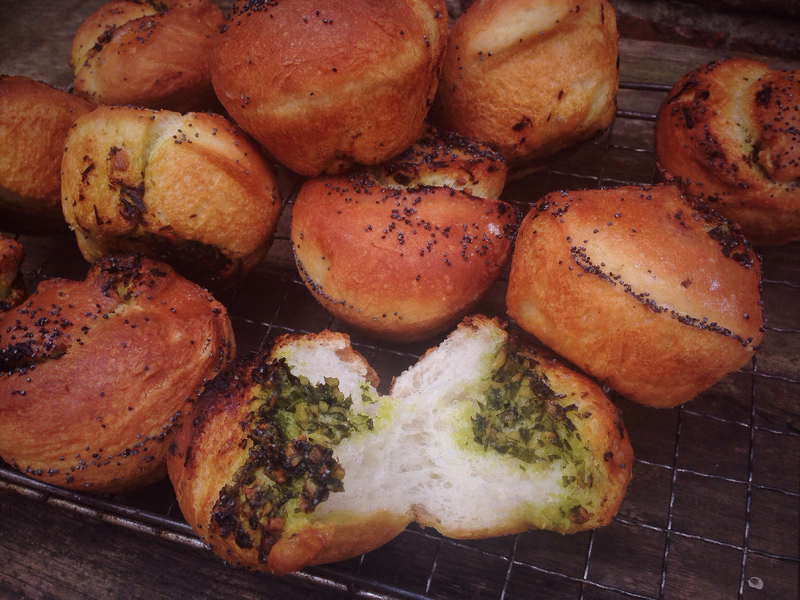 6: Roll lengthways from bottom to top, stretching as you go to make a swiss roll kinda thing then slice into rounds and place these into an oiled muffin tin. 7: Cover and allow to rise for an hour or so in a warm place. 8: Sprinkle with some blue poppy seeds and bake in an oven heated to 180C for around 25-30 minutes, during the last 5 minutes brush the tops with more olive oil. The rolls are ready when you tap on the base of one and it sounds hollow.